I cannot believe this is my final post. It’s weird that this officially means it’s all over and it’s really weird to reflect on the experience and consider what it all means to me now and what it will all mean to me in the future. There was so much I learned and I think I covered a lot of that but one thing I haven’t really talked about it how grateful I am to have been a part of such a wonderful project with such a wonderful group. 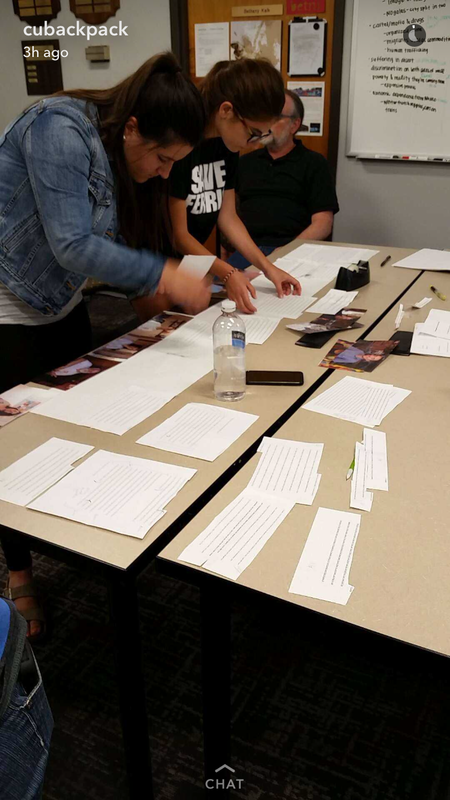 I’ve spent a lot of time reflecting on the deeper aspects of the project, but we had a lot of fun too. Living in a small house with 16 people can either be really fun or just the worst and it was really fun. We danced while making dinner, we danced while doing dishes, we played ridiculously specific rounds of mafia. We also met so many incredible and interesting people. One night we went for dinner and margaritas in Mexico with a lawyer who was prosecuting for a family whose 15 year old son was shot on Mexican soil by an American guard on the border. His son and his son’s friend were there as well, both had family in both the Nogales, Arizona and the Nogales, Sonora side. The level that these two cities and their cultures are intertwined is truly astounding, especially when you see this massive iron structure sneaking between the two. We also met a priest named Father Peter Neely who had been living in Nogales for some time and was extremely intelligent and well versed on the issues. Some of my most profound understandings came from talking with him. He introduced to some ranchers who own a massive ranch right on the border and have hours of footage of cartel members carrying huge packs of drugs through their land. There were just so many layers and so much to take in, but having people there going through the same experiences who you could laugh with and cry with was something truly special. One of my favorite times spent with everyone was when we went to a lake in Arizona, near Nogales. We spent the day swimming and A.J. (aka the group’s “dad”) cooked us all burgers and hotdogs (burgers and water–my two favorite things). Later that night, some of stayed to fly the drone and play soccer. John called us over, saying he was going to teach us to meditate. So, approximately 10 of us sat down on the ground in a classic meditative position (legs crossed, hands palm-up on your knees) facing the water. At this point, the beach was still pretty crowded; people were boating and swimming, and it was probably a pretty funny (or super creepy) sight to see 10 people sitting in that position, dead still and dead silent, eyes closed, for 10 minutes straight. So, yeah, there were a lot of those funny moments throughout the trip which just made it so enjoyable and I feel like, right now, that’s what I’m holding onto. The profound experiences I had and the things we learned are things that will take more time for me to process, but I have no trouble saying I had the best time with the best group at the best school. Getting tacos together for John’s birthday. I think the best way to describe the way this experience altered me is by what something Nico said during our final reflection. He said something to the effect of “We’re not just putting names and faces to the issue, we’re putting real, actual people to the issue,” and he could not have been more right. It wasn’t just seeing these issues firsthand that got to me, it was learning about these issues and then meeting and become friends with the people these issues affect that really changed me I think. And I’ve said this a million times, but I think it’s so special and so important that we have the ability to share these stories and these people with an audience. I think that’s an incredibly powerful tool and has led me to appreciate and love journalism and all its many facets and capabilities so much more than I already did. As far as the issue itself, I think the biggest thing is that it makes me wonder what else is out there that I don’t know or that is so largely misunderstood. It just blows my mind that all of this is happening right under our noses and people, including myself, have been able to remain so ignorant about it. Again, I think that makes me appreciate the importance of journalism and makes me want to discover and share more. It also blows my mind, from a political standpoint that there’s such a lack of knowledge. I would love to see politicians visit Kino and look at these issues firsthand before passing policy and legislation. This is an issue that cannot be resolved from afar, because the bottom line is that things aren’t working because there isn’t a concrete enough understanding of what the issues are. I guess, to that extent, I find myself getting frustrated by our political system and by the backwards structuring of it all. 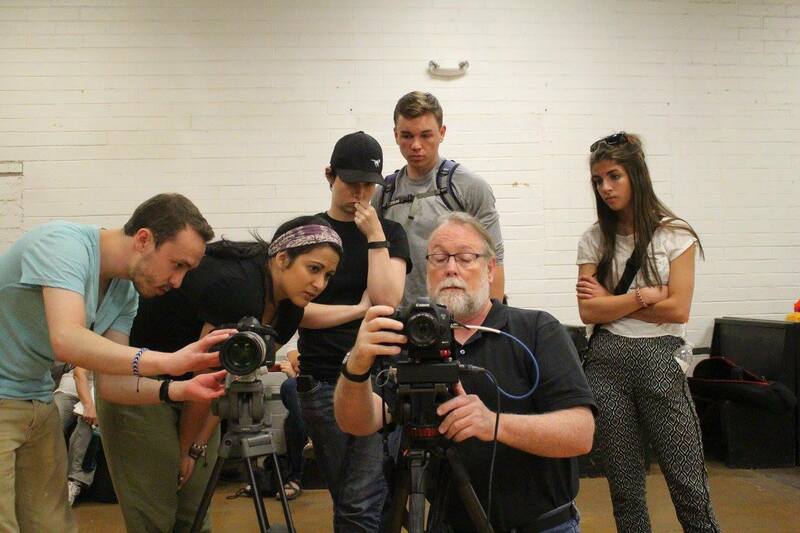 But overall I think this trip has helped me understand how incredibly powerful journalism can be. Literally, trying to make sense of everything we’ve heard. Yesterday, we said goodbye to Pepe at the comedor. “Tu es una buena Amiga,” you are a good friend, Pepe said to me as I gave him a final hug. As soon as I stepped off the steps of the comedor onto the sidewalk outside, I lost it. I quickly walked down the sidewalk past my group to hide my sobs. Pepe is planning on returning to the border on Saturday, the same day we returned to Omaha. I think there is an inherent part of us that has preferred to accept fantasy over reality since the time of the very first story, however many thousands of years ago. Those stories and fantasies have turned into popular novels and major blockbuster films, often telling incredible stories of doing the impossible. We eat these franchises up; sometimes, they’re even based on true stories. But, there’s a reason these incredible stories are so incredible. Literally, these stories are often not credible, as in they’re barely believable. They question reality. Movies and books take us to a place we’re not used to end give us a hero and a happy ending. That’s what we’ve come to expect from stories. So, when Pepe told us he was crossing again on Saturday, my first instinct might before have been to imagine him triumphantly struggling through the long journey north, only to come out victorious on the other side. I imagined him meeting his son for the first time. Maybe we could get him to Nebraska, or maybe we’d visit him in California, and we’d all have a happy ending. But the rhetoric I’ve been listening to all week does not tell that kind of story. So, when Pepe told us he was crossing again on Saturday, I thought of the migrant trail we walked, littered with rusty cans and empty gallons of water, where hundreds of migrants die each year. I thought of Pepe’s injured leg inflicted by the kick of a border patrol agent after Pepe surrendered himself last time. I think of the parade of 75 migrants chained hand and foot in front of a judge where they are given no chance to tell their story. I think of the floods of new migrant faces I’ve seen enter the comedor over the past two weeks, their faces swollen with bee stings and barbed wire injuries, their bodies weak from dehydration, and their limbs bruised from banging around in the back of a caged truck like animals. I think of the cartel, watchful, dangerous, and heavily armed from their perch in the mountains. This is the reality of this story and the story of hundreds of thousands of others. This is the reality that finally hit me when I put my friend Pepe’s face to the horrors I’d heard this week. That’s the truth and it’s something I’ve never had to face, but now it was literally looking me in the eyes. Of course, the movie-loving side of me still imagines pepe’s triumphant crossing. That part of me lets me sleep imagining him holding his baby for the first time and tears of joy streaming down his face. It allows me to imagine a system that doesn’t separate father from son, a system that looks into individual cases of deportation and asks the migrants, “why did you come here?” instead of “do you plead guilty?”. It’s a system people are fighting for and that gives me hope for a happy ending, but for now things are broken and people like Pepe don’t really have a chance and people like me are able to offer little but a choked up “Bueno suerte,” good luck. The biggest fear people have when it comes to immigration from Mexico is that we are letting criminals and drugs stream over the border. To a fairly large extent, this is true. The problem comes with our government’s inability to separate the drug trade from people who are crossing to escape violence and reunite with their families. Because this distinction is not made, all Mexican migrants are essentially treated the same. People often ask why migrants can’t simply cross the border legally. There is a 20 year waiting list for Mexicans to get a visa, even though immigration into the U.S. is actually the lowest it’s been in 50 years. Waiting 20 years is probably not a viable option for immigrants fleeing from violence, or trying to get to the family they’ve been separated from. So, all migrants are forced to cross illegally. Many of these illegal immigrants carry drugs across the border. 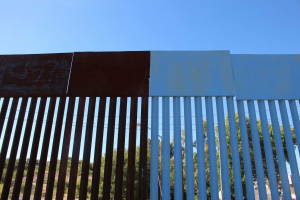 Border security has been increasingly heightened and militarized, making it harder than ever for migrants to safely make their way into the United States. So, these migrants have very few options. This is where the cartel comes in. They know the border and the surrounding areas extremely well. They are able to successfully go back and forth across the border with no problem. In this way, they become many migrant’s only hope. Migrants pay thousands of dollars to cross the border under the cartel’s protection. This means more revenue for the cartel and more backs to load their supplies of drugs onto. Essentially, by making the border inaccessible to anyone, we are causing migrants to aid in the very practice that we fear most about immigration: criminality and drug smuggling. This knowledge and this frustration that I have developed over the course of this trip is what makes this trip different from any experience I’ve ever had. It was such an intense few weeks of learning and growth that led to so much understanding about the complications and misconceptions of the issues at hand and I don’t think I could have found that anywhere else. 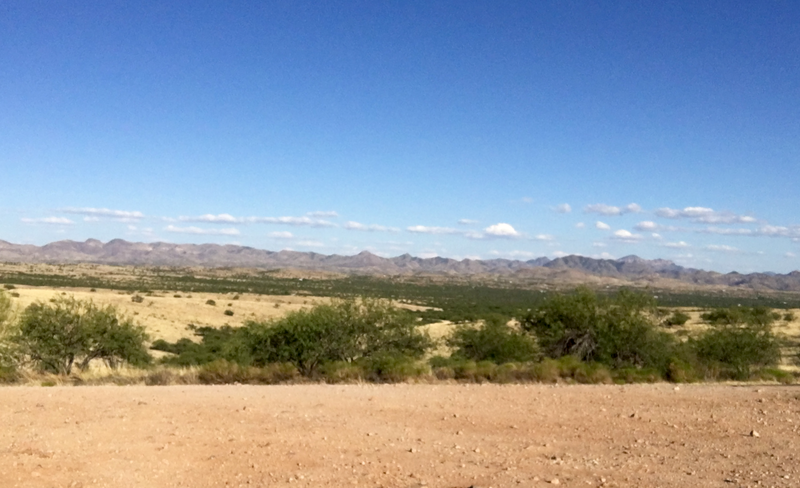 The wall between Nogales, Sonora and Nogales, Arizona. On Saturday, our group went on an interesting adventure. 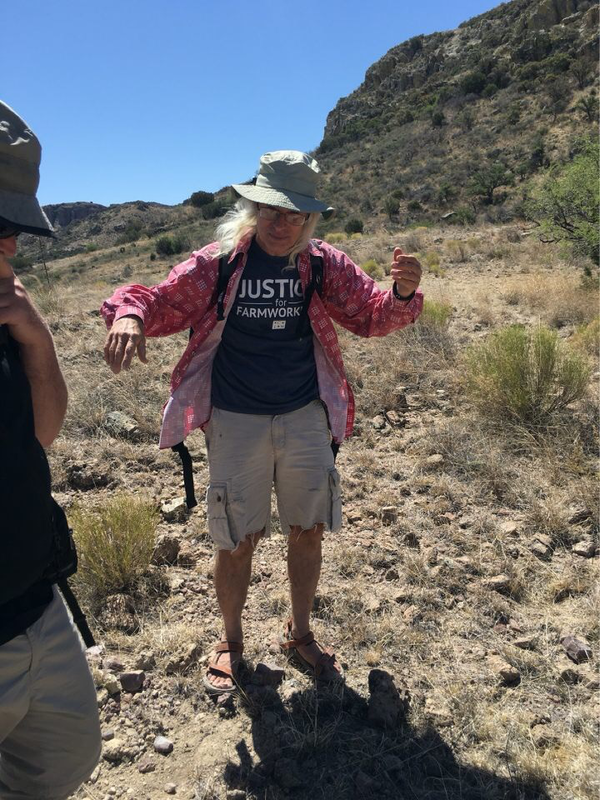 We followed a soft-spoken Quaker man, whose white hair was longer than mine, into the desert in order to gain a better perspective on what migrants go through on their journey north. Our fearless leader, “Lil John” as we called him, took us under barbed wire fences, over walls of rock, and through uneven rocky brush lined with heavily thorned desert plants under the early morning desert sun. I went through 4 bottles of water. As we moved from the cattle path to the migrant trails, the reality of where I was didn’t really hit until crawling under the second barbed wire fence of the day. While brushing myself off on the other side, someone pointed out a discarded sweater. It looked like it used to be white, but was torn, weathered, and caked with dirt, turning it a stained dark brown. It appeared a migrant had discarded it right before crawling under the barbed wire we’d just come through. As the trail continued, I noticed the occasional rusty can littering the sides of the trail. After a while, we reached an opening in the valley trail. A small shrine had been erected out of a natural opening in the side of a small cliff. A tree branch to the right of the shrine had gallons of water hanging from strings with messages of prayer and good will written across them in Spanish. On the ground lay several more gallons of water, as well as cans of beans. The shrine itself was decorated with candles, crosses, and images of St. Mary. It was an incredibly surreal place to see in the middle of a trail that meant death and pain for so many. In the midst of illness, death, injury, and pain that lines this journey for so many, there is a small ray of hope and comfort. Ironically, that aid is provided by a group of activists from the very same nation that at once draws and rejects people. The same country that hunts these migrants down on this journey, also produces people who aid them on the way. If I’m being honest, I didn’t know what to think about this juxtaposition. I guess it reminded me the more positive aspects of The United States’ system after two weeks of feeling frustrated by my country’s continuous blunders. Out of all the backwards policy, the ability and the choice to help people in need still remains. Lil John showing us the migrant trail. A few days ago, I found myself getting really frustrated. We were interviewing a retired defense attorney and passionate activist for immigration rights, Isabel Garcia, and she gave us so much to think about. “I wish all of America could have been in there,” someone said. I 100% agreed. I, too, wish all of America could have been there. Instead, her audience was made up of a select number of people who already cared enough about immigration to seek these answers. The people who need to listen to people like Isabel Garcia or, more importantly, the people who need to visit the comedor and look onto the faces of humans hurt by poor policy, misplaced fear, and discriminatory hatred, aren’t going to seek those answers. The people already asking the questions are the people ready to hear the answers. Think about how information is disseminated today: largely through social media. I get most of my news through my Twitter and Facebook feeds based on what publications I follow. I read, watch, and share articles that are consistent with my own world views. John Oliver’s HBO segment “Donald Drumpf” had a record breaking 85 million views. In my opinion, that segment was brilliant. I think everyone who supports Trump should watch it. This goes for a variety of good articles I have read on him as well. However, I know the people watching and reading articles and videos that substantially oppose and dispute much of what makes him popular are people who, like me, are probably not supporting him anyways. Similarly, while I think everyone who opposes immigration should come to the border and look at the issue firsthand, or at least watch our video with an open mind, I know that’s probably not likely. This realization hit me hard. Could the people who call migrants criminals and demand they all be deported look Pepe in the eyes and tell him he does not deserve to meet his 7 month old son? Could they look a migrant in the eye who has lost his leg from diabetes because his medicine was taken from him by border patrol and say ‘You deserve to be dehumanized.’? Could they they look a man who has lived and worked in the United States his entire life and doesn’t know a soul in Mexico and say ‘You don’t belong in my country.’? Could they look the mother of a 15 year old girl who lost her life on the journey north in the eyes and say “Your daughter was a criminal.’? In the midst of this frustration, I talked with someone who made me consider an important point. Before this trip, I was not anti-immigration. I did not believe in the wall. However, there was a lot I didn’t understand and a lot I hadn’t considered on either side of the debate. The 11 other students I’m here with have expressed similar sentiments. When we were interviewing Isabel Garcia, we asked her what, if anything, gave her hope for the future of immigration reform. She said she saw hope in our generation. The responsibility falls on us, and she believes someday we’ll look back at our current system and wonder how we could have ever let it get this bad. I think there is a lot of truth to this. Although we might not be able to illicit change dramatically enough to completely shift a person’s worldview, we can educate people who don’t fully understand the issues but are open to learning. While many people are stuck in their ways, many more people, such as the 12 students who signed up to take a 24 hour van ride to the border of Mexico, knowing little to nothing about the issues at hand, are willing to learn. It’s those people who will hopefully be moved by our project and inspired to take action. Setting up the shoot for Isabel Garcia’s interview. Wednesday, I spoke with another migrant. This time, the only English he spoke was “Hello”, “Goodbye”, and “Gimme five” (as in give me a high five). We made eye contact from across the room as he was drying the dishes from lunch. I had just returned to the comedor after shooting some B-roll around the city. He smiled and held up his rag. I smiled back and walked over. “Cómo estás?” How are you? I asked, grabbing a rag to help dry. He asked me, with some surprise, if I spoke Spanish. “Solo un poco,” Only a little, I replied. He told me his name was Pepe. At this point, I wasn’t sure if he was a migrant or a volunteer since I had seen him help carry in boxes of food earlier that day. After a few minutes of conversation consisting of me trying to adequately respond to him in my broken Spanish, I figured out that he was a deported migrant and had actually just been interviewed for our documentary while I was on the streets getting footage. After the dishes were done, we sat to “talk” some more and another student who had been there for his interview, Maria joined us. I learned that his birthday was on Cinco de Mayo. I guessed correctly that he was 25. He guessed incorrectly that I was 16. I told him how a waitress had made a similar mistake at a restaurant earlier, causing the entire group to get kicked out of the bar, even though I was legally allowed to be there, because I had left my passport in the comedor. He laughed once he deciphered my lengthy, undoubtedly confusing account of that incident. I told him I was from Minnesota. He told me he hoped to go there someday. He asked me if it was beautiful and I told him it was. He told me how long he’d been at the comedor. He told me about crossing the border. He said he’d encountered three dead bodies and been abandoned by two comrades along the way. He told me he had a 7 month old son whom he’d never met. He only had photos and sometimes he called his son’s mother, trying to listen to his baby’s voice. This was the content of an hour long conversation, filled with many “repite, por favor”s, repeat, please, and a lot of laughter as I tried, and failed, many times to form coherent sentences. The more we communicated, the less the language barrier seemed to matter. The limits proved most difficult when the conversation turned serious. If the only words of sympathy you can offer are “lo siento,” I’m sorry, how can you properly respond to a man who’s risked everything for a child he’s never been able to meet, and has almost lost his life in doing so? Then again, would I have been able to come up with a better response in English? Honestly, probably not. Pepe told me that when I couldn’t think of a word I should use “signos”, signals, to communicate. Maybe I should have given him a pat on the arm, or grabbed his hand to signal my distress at his pain. Instead, when he told me “Es difícil, es muy difícil,” It’s difficult, it’s very difficult, I could only look at him and offer a “lo siento” as I watched his eyes fill with tears and his face turn away. I wanted to share in his pain. I wanted him to know that watching his heart break broke mine a little too. The language barrier is an interesting thing. Later, when we were laughing about my language skills (I was trying to figure out whether I should use ser or estar–two different versions of “to be” in Spanish) I found myself repeating the phrase he had used earlier: “Es difícil,” I said with a laugh. Even though the words were the same, the different contexts were clear to both of us. Within the language barrier, there is a basic understanding: a human understanding. It’s an understanding you can feel without words. I know when someone looks me in the eyes and tells me something has been difficult, it means something different than me throwing back my laughing and protesting “It’s difficult.” We can both feel the pain; we can both feel the laughter. That understanding is not limited by age, race, nationality, wealth, or language. Humanity is connected by these mutual understandings, and it is through them that we truly communicate with each other. I didn’t need to fully understand his words to know that he was suffering. He didn’t need to understand mine to know that I care. In this way, I gained a new perception of the so-called language “barrier” that supposedly divides people from people, the same way an iron wall is supposed to divide people from people. It’s meaningless; it only exists through fear. In the same way language couldn’t stop us from communicating, the wall couldn’t stop our two world’s from colliding. The wall, a political structure meant to protect us from our fear, doesn’t work when we dare to cross those walls, to cross those barriers, to learn what’s on the other side, and to learn what’s on the inside. 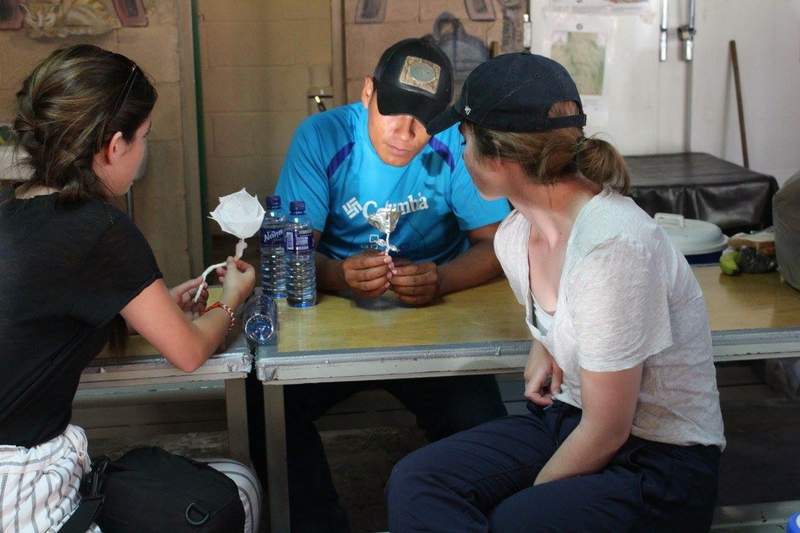 Pepe showing my fellow backpacker, Maria Fagerland, and me some flowers he had folded. If I’m being honest, I did not know what to expect when I crossed the border for the first time. We were told, as we walked along the outside of what has been compared many times now to a “cattle chute” that leads deported migrants back over the border, that we would be heading to the “comedor”, which is a shelter for newly deported migrants. Some migrants had been there for weeks, some had just arrived this morning. The newest arrivals would be filling out surveys to document any abuses they may have endured. The idea that we would be encountering people in such a freshly vulnerable state, people who had just experienced possibly the most traumatic experience of their lives, having been cuffed by hands and feet and thrown into a caged walkway by armed guards as early as an hour ago, was terrifying to me. I imagined myself after some of the most traumatic moments of my life, but those were in no way comparable. So, I tried to put myself more directly in their shoes: if I had just been deported from a country after having lived there for years, or after having spent months of risking my life to get there, I imagine I would somewhat resent seeing people from that same country waltz over the border and then waltz back again. With that in mind, I prepared myself for discomfort and a certain degree of hostility. Upon arriving, we were greeted by several mumbled “Buenos dias” and two tiny, Hispanic nuns, one whose black hair curled into a perfect bob, highlighted by sleek silver stripes, and one older one whose crown of white hair laid royally over her leathered, smiling face. Both whisked around the room like 20 year olds, ordering volunteers around in rapid Spanish, a group we were quickly added to. A Kino Border Initiative employee, Joanna, who had led us across the border, translated their orders. 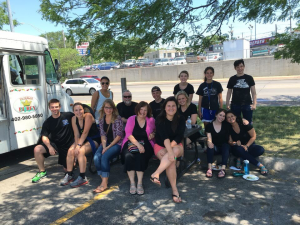 We helped serve breakfast, and the two nuns went through a variety of exercises, leading the mob of migrants (all men except one woman at a table by herself) into laughter. “That’s what I like to see, I like to see those smiles,” the white haired nun said, (but in Spanish, so this is a rough memory of Joanna’s translation). After helping clear up, the nuns asked for eight volunteers to help with clean-up. The migrants quickly filled those positions. I was assigned to dish-washing, along with another person from our group and a middle-aged man with a scruffy, gray/white beard whose English was impeccable. Joanna commented on this, and he snorted, “I’ve lived in the United States since I was four,” he said. I began to ask more about him and he told me his story. He told me he was left for dead in the middle of the desert and suffered over 40 bee stings. He told me he’d grown up in southern California, but he’d been all over the U.S., Chicago, Alaska, etc. He told me he used to be a chef at a country club in Santa Monica and that he’d driven a BMW. He told me had four kids, all currently still in the U.S.
After talking about these things, a helplessness and sense of bitterness began to creep into his voice. He spoke about how he’d tried to do things the legal way, but the U.S. “didn’t like” his papers. He said he was scared to cross illegally now because he didn’t want to be detained and charged, which could lose his chance of ever getting back. He’d lived in the U.S. all his life and didn’t know a soul in Mexico. I didn’t ask him his status as a U.S. resident, I didn’t ask him the circumstances surrounding his deportation. It was a somewhat brief conversation and I didn’t know how much I wanted to pry (although the journalist part of me, of course, wanted more detail). But towards the end of that conversation, in the midst of his despair and anger at the U.S. government, he said something that really stuck with me. He said thank you. He thanked us for being there. He thanked us for caring. He said most people didn’t care. That really touched me because the purpose of this project, of most journalism projects, is to tell a story. However, it’s important to tell these stories with the respect and consent of the people whose story you’re telling. In other words, it’s important that the story’s subjects want it to be told. To have that reaffirmation on my first day, to realize I was working on a story that was not only worth telling, but one that needed and wanted to be told, was extremely touching and boosted my confidence in being there that day, and the days since. I never get nervous. I love giving speeches. I use to dance in front of hundreds of people and never get nervous. I moved away from home when I was 16 and moved to Connecticut, but I never once was nervous. But the night before the trip to Arizona I am nothing but nerves. I feel sick to my stomach, a sensation I’ve never really experienced in terms of anxiety before a trip. I’m not sure what exactly is the cause of my nerves. It is a mix of excitement and stress. I want to make sure that this film is honest and that it tells a story. I don’t want to mess up filming, interviewing or to be the one who forgets to charge their camera battery (sorry nico). I want to move outside my comfort zone and to do an interview and use the camera. I am hoping that after this trip I will be willing to take more risks. If I am able to do that I think it will have a profound impact on my quality of life. I wish I was joking. I need a constant schedule. I like how distracting schedules can be. But I get stuck in the constant motions and tend to not notice all the amazing things that are happening around me. The good thing about these next two weeks is that I can’t micromanage my life. I like think that it’ll be a different type of schedule and structure that I’m not use to. The days will be long but it’ll be a new adventure and new task everyday. Hopefully after his trip I will be able to input that idea into my everyday life and not get stuck in the motions.